There is no word can express how much I love spring onion pancake. There are some Shandong Pau shops in Singapore. They also sell Cong You Bing. Yet, The ones they sell are not the same to the ones I like. Spring onion cake I like is the crispy type. My mom is super good at making amazing spring onion pancake. Too bad, I can’t find any similar to my mom’s. So I have to figure out by myself. And recently, I cooked spring onion pancake again, just because I really missed them. In my previous post, I applied my mom’s advice: Use half hot water and half cold water. But this time, I think I figure out some secret to make good spring onion pancake. No matter use hot water or whole cold water. The key is soft dough, which means you better use more water to make sure dough is soft enough. If the dough is hard, then the pancake will taste hard and dry. Use more spring onion, seasoning and oil. Obviously, it is true. Spring onion, and seasoning will make a lot happen during frying. Low medium heat is better during frying. This is important to make sure the outside layer is crispy. If the heat is high, it’s easy to be burnt outside while the dough inside is still raw. 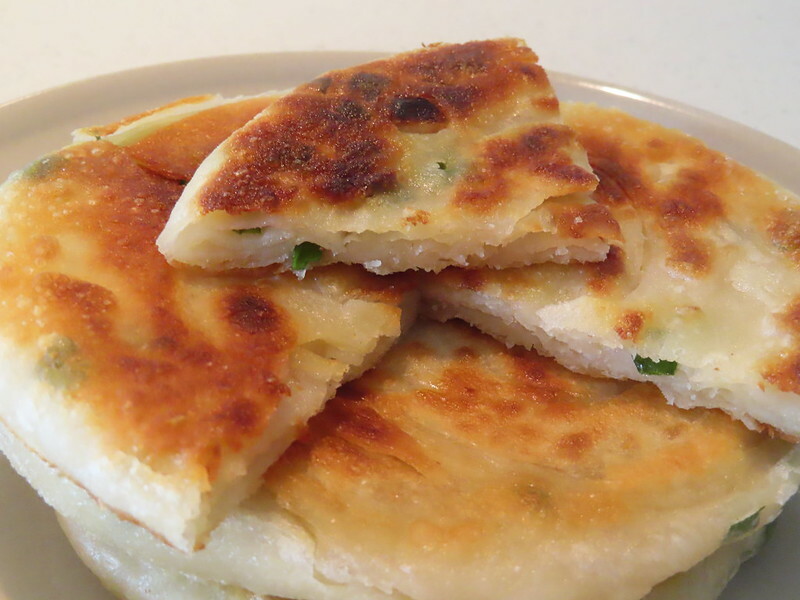 Crispy spring onion pancake is the true spring onion pancake. My husband also loves it.